I have a system running 4k fine. Windows 10 + kodi 17 + Gt 1030 with hw acceleration can run the 400 mbps jely fish example with nonstutter. However I have a 60Gb hevc 4k hdr file that stutters when I play it in kodi even with hw acceleration. Any ideas whay could be causing this? Seems to run fjne outside of kodi. This is the third time you have asked this question. Your other posts have been removed. Do not ask it again. First warning. How about you give us some more MediaInfo details on your HEVC file, instead of letting us guess what the problem can be? Perhaps the HDR part is a problem. Or for all I know, it can still be a crappy encoded video. Plus missing the most vital thing of all, a debug log_file (wiki) since most of us aren't into guess work and my delivery of a crystal ball never showed. MediaInfo. Ill post debug_log tonight. Sorry. The other questions were about HEVC main10 on windows7. Firgured out myself after asking that it could only work on win 8+ so I upgraded to windows 10. Now seem to have another problem. The questions seemed related but they werent. It was me going trough the process of figuring things out. 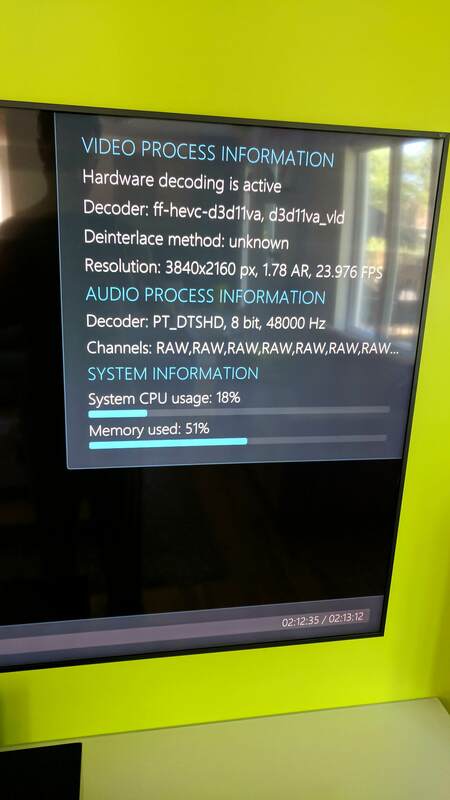 Last I tried, Kodi internal videoplayer cannot decode HDR, period. Nor v.18. I don't think that has changed. Is this not the case? The 400mb jellyfish file is just HEVC but it's not HEVC UHD HDR. You would need an external player to decode and render that, explained in detail in the guide in my sig. That is not a debug log, follow the link I posted for instructions if you don't know how, in addition you don't appear to have tried playing anything during the session the log has recorded. What I can see from the screenshot is that dxva hardware acceleration is being used and CPU usage is pretty low for 4K UHD so it would seem Kodi is doing things rights and the system is not struggling. Fwiw, in my testing GTX 960, very high bitrate UHD (4k) hardware decoding is not a problem. CPU and memory remain very low passing the workload to the GPU using DXVA2. Pure bitrate is not the problem. The GT1030 is capable of doing 8K HEVC video. Correct. The point is ...... the OP is comparing apples to oranges. He can play high bitrate HEVC but not high bit rate HEVC UHD HDR. I'm simply pointing out HEVC is not a problem. HDR is. While the HDR is rendering, Kodi is not reading metadata and switching the display into HDR mode. I assume he figures even so, why is it stuttering, which is a pretty good question. Afaik, it should render without stuttering even though it's not decoding and displaying HDR. Perhaps there is a conflict in the internal videoplayer causing this issue seeing as we know high bitrate UHD is not an issue. *EDIT* Just tried an HEVC HDR. No stumbles from a 4GB GTX 960. Very smooth, but not in HDR of course. That would mean no conflicts in the internal videoplayer. Just no HDR decoding. No idea why it would stutter for the OP other than the 1030 is what ..... 2GB? Doubt that memory difference is the problem. I think it's system specific like perhaps GPU settings in the control panel or maybe even codec conflicts somewhere depending. Not enough input to draw any rational conclusions. (2017-07-30, 20:40)brazen1 Wrote: [ -> ] Correct. The point is ...... the OP is comparing apples to oranges. He can play high bitrate HEVC but not high bit rate HEVC UHD HDR. I'm simply pointing out HEVC is not a problem. HDR is. While the HDR is rendering, Kodi is not reading metadata and switching the display into HDR mode. I assume he figures even so, why is it stuttering, which is a pretty good question. Afaik, it should render without stuttering even though it's not decoding and displaying HDR. Perhaps there is a conflict in the internal videoplayer causing this issue seeing as we know high bitrate UHD is not an issue. So what do you need from me? Anything more I can do? I assume that this stuttering is not happening all the time in your sample file but just during the scenes where the bitrate is higher? I have experienced same kind of issues and although also my setup (windows 10, i7-5775C, NVidia 1050Ti) is more than capable of HW-decoding and playing 4K HEVC Main10-files, 32-bit Kodi 17.x can still struggle. This is not related to HDR, perhaps some strange timing issue as CPU/GPU are not struggling at all. If High Performance -power plan is toggled on in Windows-settings, this issue mostly disappears in my case. The main thing here is that the CPU is not dynamically changing the clock speed, by default in High Performance -mode CPU is running in full speed.